It’s the middle of April, and I have been hiking a six-mile loop of trails at Bear Valley Trailhead in Point Reyes National Seashore: Bear Valley trail to Pine trail to Sky trail, and back on Bear Valley. The best five minutes are in the early afternoon, when I’m about half-way and coming out of the trees and into the open. The ground right here is hard and full of rocks and small stones instead of soft with the pine needles I’ve been walking on. The sun overhead is bright and glaring; it’s hot and I’m sweating hard. In the mid-distance is Mount Wittenberg, but about an eighth of a mile ahead, the trail smooths out and winds to the left around a low hill completely covered in golden poppies waving and shimmering in the light breeze. It’s an amazing sight you don’t get to see unless you’ve worked for it, since it’s a considerable climb no matter which way you come up. I’ve been anticipating this and I never, ever tire of it. I push ahead until the poppy-covered hill is on my right and a gradual, rolling, dark green, and lush drop-off on the left exposes specks of tents and tables from Sky Camp far below. Beyond that is the blue-green water of Drake’s Bay lapping at the shore, sunlight rippling the surface. I’m so thirsty I stop and take a long drink of water from the plastic bottle in my backpack. The water’s warm but I gulp it, marveling at how much better water tastes when I’m hiking than at any other time. I stand still, gazing at the distant water and letting the sweat evaporate from my skin. I smell the dust of the trail and the pine trees. I turn to look at the poppies again, drinking in the sight as a couple of orange and yellow butterflies flit in and out among them. What are the best five minutes of your perfect day? As much as I love New Mexico, my favorite place is not here but in California, where I lived for 30 years. It’s Pt. Reyes National Seashore, 70,000 absolutely gorgeous acres of park land and nature preserve located in Marin County. I’ve said for decades that if anyone were to gift me with a small cottage in Bear Valley and transport me into it, I would happily remain there for the rest of my days. Although I had easy access to many hiking areas including Mt. Tamalpais, Muir Woods, and the Marin Municipal Water District, Bear Valley trailhead in Pt. Reyes was my favorite. 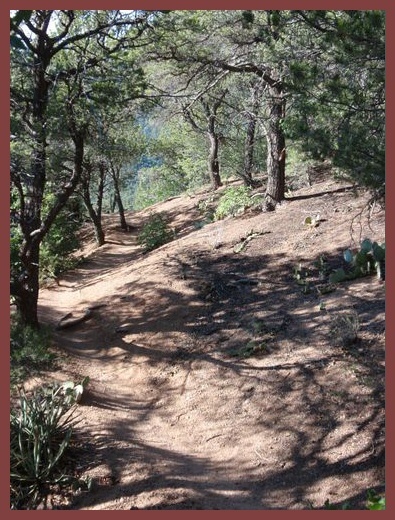 Just as Pino Trail at Elena Gallegos Park in Albuquerque is my current go-to trail, my go-to trail in Pt. Reyes was a loop that included Bear Valley trail to Old Pine to Sky to Mount Wittenberg and back to Bear Valley. There’s an area along Sky trail that steadily inclines as you get closer to Mount Wittenberg. The path is gravelly and out in the open. The best time to hike here is in the spring, because just at the point when the thought might cross your mind that this is not so much fun, you turn a corner and are faced with a brilliant display of bright orange poppies against the side of a hill that is guaranteed to stop you in your tracks to celebrate the moment and the fact that you’re alive. I haven’t been back to Pt. Reyes in almost six years, but the place always feels like home to me. I’ve hiked there alone, with groups, with various friends, and most often with my partner, who died 10 years ago. He was much more of an outdoor person than I was when I met him shortly after I moved to California from the flat land of eastern Michigan. I can still remember purchasing my first pair of hiking boots. They cost about $35, which seemed like a lot of money in 1975, but I didn’t have to replace those boots until I moved to New Mexico. Of course I miss Pt. Reyes and plan to visit it again, but I spent so much time there and have so many memories of my experiences in it that it doesn’t really matter if I ever get back. There’s a part of Pt. Reyes that’s inside me now and always will be. Hiking is absolutely one of my favorite things to do, so even though the weather has not been conducive to hitting the trails lately–nor has my schedule–a series on celebration has to include it. Here are accounts of four hikes on (mostly) my favorite trails in the area. Pino Trail is my go-to hiking trail for two reasons. (1) It’s just over a five-minute drive from where I live. (2) The variety and the views never get old. These photos were taken on a short solo hike on a late afternoon in the summer, with the temperature around 94 degrees in the unshaded stretches. I went out by myself to see how the ribs I’d bruised the previous week handled my day pack and the heavy breathing from a little extra exertion. This trail is very popular, but during my two hours out there I encountered fewer than half a dozen other people; apparently the heat kept everyone else away. My bruised ribs proved not to be an issue. In fact they felt better after the hike than they did before. While I love all the gorgeous vistas from this trail, the shot directly above is my favorite. This hike was definitely not a hit. On the way up, my hiking partner and I heard the growl of either a black bear or a mountain lion, and on the way down I took a minor spill on the uneven, rock-strewn path. On the plus side, we gained 1,750 feet in a little over two miles, moving under continuously blue skies with a scattering of bright white clouds, in very comfortable conditions. The view from the top was amazing. A stone outcropping provided convenient level seating for a snack break (watermelon and almonds) and the opportunity for us to take it all in–along with a few photos, of course. The less said about the trek down, the better. Of the wildflowers in bloom, sunflowers dominated. There were also more butterflies flitting around than I’ve ever seen anyplace outside the Butterfly Pavilion at the Botanic Garden. Tree Spring Trail, one of the most enjoyable trails in the area, is located on the eastern side of the Sandias, which makes it a cooler and more comfortable hike in the summer. My hiking companion and I started from Tree Springs trailhead off Crest Highway, hiked up to the crossroads where Tree Spring Trail meets 10K and Crest trails, and then meandered along 10K for a while. This hike was a winner, even though the trails are popular for mountain bikers, and we had to do a lot of scrambling to get out of the way. I couldn’t believe the profusion and variety of wildflowers. The weather gods provided an absolutely perfect day for hiking this trail, most of which is in the open. The temperature ranged from low 70s to mid-80s, the sun shone brightly, and there was nary a sign of rain. There were lots of gnarled dead trees along the trail. At one point I turned around to see this row running down the side of a hill. The number of wildflowers was surprising. I managed to get a few halfway decent shots and to identify a couple more species–both purple. The mountains and sky seem much closer from the perspective of the trail. They’re a good reminder to look up from time to time, to check out the distant view. Sometimes you need the wide-angle lens. Armijo Trail ends at Faulty Trail, which runs 8.7 miles altogether, but is an interior or connecting trail, so you can’t get to it directly. We could have gone either north or south, and chose north to make our loop. The terrain on both Armijo and Faulty was up-and-down, which was unusual and very welcome. Most of the time you figure on going UP. And then coming back DOWN. A portion of Faulty Trail follows an actual fault called Flatirons Fault. I can’t get enough of this place. It’s awe-inspiring, wild, and restorative all at the same time. I think it was on Faulty where a fellow hiker warned us he’d seen a bear off-trail about 200 yards back (in the direction we were headed). Just before Faulty crosses Cienega Trail, there is a short, very steep descent against the north face of Cienega Canyon. The views were spectacular! I failed to capture the grandeur, but I did succeed in making it down, which was sufficient accomplishment. After the short leg of Cienega Trail, we snacked at an actual picnic table, then crossed the asphalt road to check out Cienega Nature Trail. We were reminded that Cienega means “wet meadow.” The area was very different from the trails we’d been on across the road. Green. And open. Lastly, we hunted for Acequia Trail for a bit before finding and following it in the direction of the parking lot, thus completing the loop. Pine cones abounded. And my friend Lee waited patiently while I took yet another photo. This very pleasant hike was five miles in all. It’s one I would definitely do again.